White City of Tel-Aviv - the Modern Movement, covers a part of the city that was developed in the 1930s as a result of innovative town planning adapted to local conditions. The name derives from the large number of white, or light-colored buildings built there in the Bauhaus or International style. The masterplan was created by Sir Patrick Geddes, and executed by various European (Jewish) architects. Over 4000 buildings in these styles can still be seen in central Tel Aviv; the largest concentration in any one city in the world. The White City of Tel Aviv is the rather poetic appellation given to one of the Middle East's youngest World Heritage Sites -- a living museum of several thousand buildings constructed in the mid-20th century in the Bauhaus or International style. The years prior to World War II brought an influx of architects from Europe to Tel Aviv, where they brought concepts from the Bauhaus school to the sun-drenched shores of the Mediterranean. I arrived in Tel Aviv on a warm spring evening in 2015, and immediately went to the Bauhaus Center at 77 Dizengoff Street to become more familiar with Tel Aviv's unique architecture. Sadly, the center was more of a store than a historical gallery, but it gave me a starting point for my walk around the city. After passing by the Cinema Hotel and Dizengoff Square, I continued for several blocks to Rothschild Avenue, home to a great concentration of Bauhaus-style buildings. Most of the buildings looked very lived in, and some were partially obscured by power lines and palm trees. Still, I appreciated the different approaches to balconies and windows in buildings on both sides of the street. The architecture was worth a visit, but I highly recommend ending the day by enjoying the sunset over the Mediterranean. Logistics: Tel Aviv is fairly easy to navigate on foot, which is the best way to appreciate the many buildings that constitute this World Heritage Site. I spent a week in Tel Aviv in February 2017. It was my first visit of Israel and I enjoyed my stay in Tel Aviv a lot! I must say: I would not have a temptation to leave the city and go to a tourist trap of Jerusalem even after one week at one place. My impression was that Tel Aviv is a blend of Berlin with a mediterranean spirit. We only gave the White City around 2.5 hours and certainly wouldn’t claim to have seen it comprehensively. 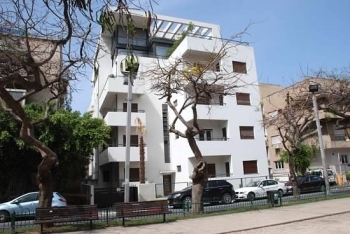 We concentrated on the areas/side streets on and around Rothschild Boulevard and Disengoff Circus and quite enjoyed the atmosphere and ambiance of the place – though Assif’s warnings about the condition of some of the site in an earlier review certainly had validity. Some of the buildings had undergone recent renovation and were looking quite smart but, to us, none of them had the wow factor either of the iconic modernist single structure WHS inscriptions or of the best of the Berlin Housing Estates. b. The so-called “Bauhaus Centre” at 99 Disengoff seems to be primarily a commercial enterprise selling anything and everything which could be “Bauhaus” branded. Nevertheless it is worth looking into for the small exhibition of photographs on the upper 2 floors. I particularly liked the very early photos of Tel Aviv such as the original laying out of Rothschild Boulevard on a sand dune! d. The areas we went to were not, on the whole, well signed/explained - a few buildings had plaques describing their history and there were a few vertical signboards but notably they all lacked the UNESCO logo – perhaps their installation predated inscription. If you like getting a photo of an inscription plaque (as we do!!) there is one on the pavement in the tree-lined central walkway of Rothschild at the first X roads south of 84 Rothschild! 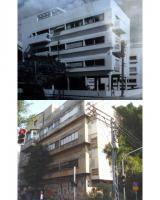 e. And 84 Rothschild provides a “nice” example of the poor condition of some of the most important buildings. The Engel House at 84 receives special mention as being the first house in Tel Aviv built on stilt columns a la “International style”. Today however those columns are filled in with breeze blocks and are graffiti covered whilst the overall “shape” of the building has been totally altered by infilling of balconies etc. Nothing I guess that a bit of money couldn’t put right but indicative of the state of parts of the site (photos – B+W of original building at top and, below, as of Jan 2014)! I travel to Tel Aviv more than 10 years ago, before it was inscribed to the WHL. I went back in June 2011 and wanted to have a closer look at the « white city ». I went first to the Bauhaus museum, and bought a detailed map showing all the protected buildings and the site limit with the buffer zone. From there I went on walks around, trying to discover the buildings listed on the map. Some are in bad need of repair. 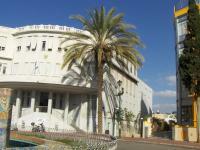 Some are well known and figure in all travel guides (Dizengoff Square, Thermomether House). But most just lie waiting to be discovered along walks. I really enjoy this king of heritage site where you can wander around. By the way, you can even stay in some Bauhaus-hotels (protected and part of the site), for example the Hotel Cinema, part of the Atlas chain. Tel Aviv is my home city and I love it. Nonetheless I feel obliged to warn the visitor from its quite ugly architecture and neglected appearance. It is a vibrant, young, interesting and welcoming city - but forget about classical beauty. The White City is unfortunately no exception to what I've just said. It's maybe historically interesting or significant, but is generally run down. The main boulevard crossing the White City is Rotschield which is nice and lively and offers great cafes and pubs. I wouldn't come with too high expectations regarding the architecture, but I'm no expert in Bauhaus. I must admit that I had not read up properly on this World Heritage Site – Tel Aviv, the White City. I knew as much as it was all about architecture and my first thought was that I’d have to go and see a few houses, an easy task… but little did I know…having visited the local tourist information I was thoroughly enlightened and given a map of the city I then realised that over 300-400 houses was included in the World Heritage Site of Tel Aviv. Representing what was called the New Movement, a Bauhaus style imported from Germany, has made Tel Aviv become a Miami-look-a-like. Together with its southern cousin Jaffa, one of the oldest ports in the world, Tel Aviv is a very nice and surprisingly laid-back city. I will forever remember the lush streets and the long beach walk where I was served the creamiest cappuccino I’ve ever tasted in my life. Last but not least I must also admit that I admire the relaxed attitude towards the Middle Eastern problems. There might be militaries, guns and checkpoints at every store or train station but the locals seem to take the whole thing with a smile. On the other hand, what choice do they have…? I have been a frequent and regular visitor and resident in Tel Aviv. Tel Aviv remains the greatest collection of Modern Movement architecture I have ever seen. Although many, possibly most buildings, have been altered, the alterations are not of a permenant nature. The most common and nearly ubiquitous change is the addition of "treeseem", sliding louvered blinds enclosing the open air porches or negative spaces of the buildings. The renovations which have been ongoing for several years are remarkable. Many of the renovated buildings appear to be pristiine in condition. Those buildiings with contemporary additions are done so that a clear and obvious distinction remains between the old and the new. 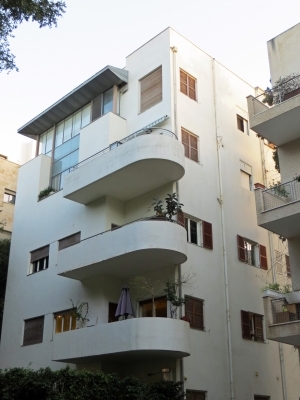 Tel Aviv is THE MUST SEE city for modernists. Modern Urban Planning: Criterion (iv): The White City of Tel Aviv is an outstanding example of new town planning and architecture in the early 20th century, adapted to the requirements of a particular cultural and geographic context. Equestrian Statues: Bronze statue of Meir Dizengoff, first Mayor of Tel Aviv, on 16 Rothschild Boulevard (near Dizengoff's home, now a museum). He apparently loved to ride his white horse trough the streets of Tel Aviv in the 1930s. The statue was designed by David Zundelovich in 2009. Sites of Parliament: The Independence Hall was the temporery seat of the Israeli parliament until the construction of the current Kneset in Jerusalem was completed.